When Inventables sent me an X-Carve 3D Carving Machine, I knew exactly what I was going to do with it...make an Electric Guitar! Making an electric guitar has been on my project list for a long time and I finally did it. Watch this video to see the process and how the guitar turned out! I have posted step-by-step instructions for this project on my Inventables Project Page. If you have an X-Carve, then maybe you would like to try tackling this project. One thing I learned while making this guitar is that double-checking your measurements and settings, as well as making test cuts, is key to a successful outcome. I tested the guitar body, neck, and fret board measurements by cutting a single pass on scrap wood before carving any of my good wood. Below is a list of the guitar parts that I purchased to complete this project. These are a mix of items from the C.B. Gitty and Stewart-MacDonald websites. I highly recommend purchasing all parts prior to carving the guitar, because the parts you use will dictate some of the guitar dimensions. 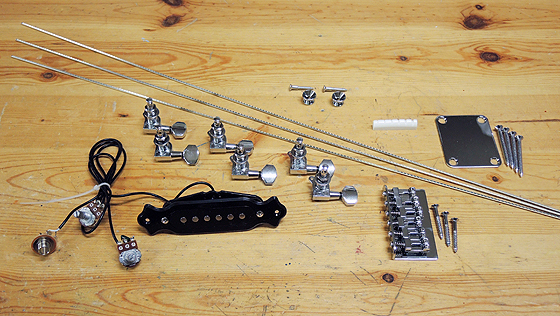 Below is a list of the tools I used to build the guitar. 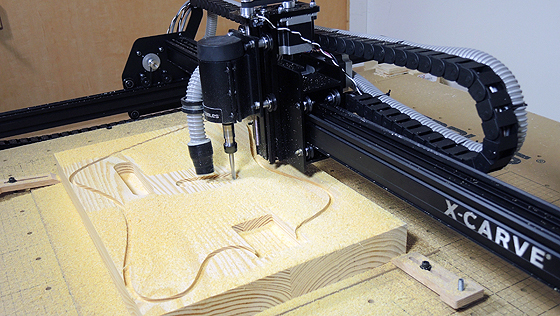 If you do not have an X-Carve, you could use a bandsaw, router, and fretsaw to make a guitar, along with the help of some homemade templates and jigs; however, your cuts may not be as accurate. Overall, I'm very pleased with how my first electric guitar turned out. It's not a Fender or a Gibson, it's just a "Carmichael". There are a few things I would like to do differently on my second guitar, such as learn how to use the X-Carve to carve the profile on the back of the neck. Keep an eye out for my Electric Guitar Follow Up video where I discuss all of the details regarding what I will do differently next time. Thank you to Inventables for sponsoring this project and providing the X-Carve, milling bits, Easel software, and inspiration that I needed to scratch this project off my bucket list. Hi Steve. Another great video - thanks. I am struggling with the X-Carve as I find it looses its x,y 0,0 coordinates during long carves. You seems to have some really long carves in this project - did you ever have that problem? Also, do you have any problems keeping your drive belts tensioned? I am constantly tightening mine. Hi Chet! Thanks! I haven't had that problem. It carved all of these long jobs with no problems. When I put it together, I read that others had belts slipping so I used one of their suggestions and wrapped the ends of the belts with electrical tape. Some people are using heat shrink tubing too. There is lots of discussion about this and other topics at the Inventables.com forum. It's very helpful. Thanks Steve. I went with Zip ties but I think that heat shrink tubing might be better. The grbl shield that runs the table, it plugs into the top of the arduino, will shut down an axis if the shield overheats. Make sure that you have a fan on it. Also make sure that the rails on the makerslide are cleanish. Make sure that the V-Wheels are properly adjusted and not too tight. Hey Chet - I know your post is older, but we had that problem yesterday. A quick call to inventables got us back on track. The motors were not getting enough current, and were falling out of sync with eachother. Take off the fan on the gsheild and turn the white plastic screws near the X, Y, Z ports a quarter turn to the right. We just had to adjust our X.
Steve - I know I owe you a few pics of my XCarve table - I'll get them to you, I promise! Went to a millworks lumber yard today to get some extra thick maple - looking to get the guitar started monday. Fingers crossed! Thanks Jeff! Looking forward to seeing your table. I recommend doing some test cuts on pine before you use your good maple, especially to make sure the neck and pocket will fit together well since your calibration can be different than mine. You can copy the easel files and change them to just cut out the pocket and neck joint parts. I would like there are a few things I would like to do differently on your second guitar , such as learn how to use the x-carve to carve the profile on the back of the neck. The back of the neck was pretty easy to do by hand, but I do want to learn how to do the 3D contour carving on the neck and for other projects too. I pick out some nice wood that is good for guitars, and probably paint it or try a different finish. I think carving flames or another design on the front would be neat too. Nice guitar, I would love to have an 1958 Gibson orange sunburst,or maybe it's called something else, but I'll look into that later. You're guitar sounds great! Here is a question to anyone comfortable with CNC. 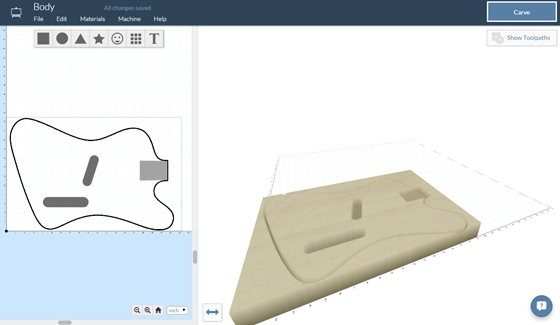 I get to use a buddy's CNC machine in several weeks so I am working for it on a layout in Sketchup. I found though that circles in sketchup are really only a group of line segments. I ask because I understand whereas other design tools use real vectors Sketchup is not a vector. Does this issue?? Read more. Where did you get the bit for carving the body and neck? I got the .25 and .125 bits from Inventables. I got the .024 bits for the fret slots off ebay. Hi Adrian, thanks! Sorry for the delay but I barely have time to make new project videos so I am not able to make many things for other people. very interesting vid ! thanks. What is the model mini of x carve to build bogy and neck pleasen? is 500 mm ok ? Make a Rad 2x4 Skateboard!